Surgeons perform the world’s first successful bilateral hand transplant on a child. 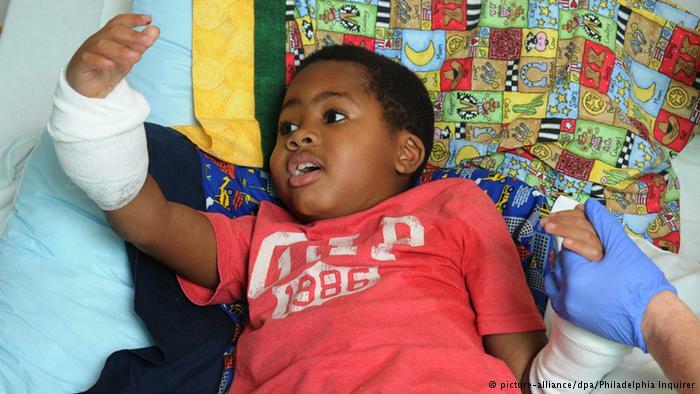 Surgeons at The Children’s Hospital of Philadelphia (CHOP) joined with colleagues from Penn Medicine recently to complete the world’s first bilateral hand transplant on a child. Earlier this month, the surgical team successfully transplanted donor hands and forearms onto eight-year-old Zion Harvey who, several years earlier, had undergone amputation of his hands and feet and a kidney transplant following a serious infection. A 40-member multidisciplinary team collaborated during a 10-hour surgical transplantation. The surgeons state that this surgery was the result of years of training, followed by months of planning and preparation by a remarkable team. They go on to add that the success of Penn’s first bilateral hand transplant on an adult, performed in 2011, gave the foundation to adapt the intricate techniques and coordinated plans required to perform this type of complex procedure on a child. CHOP is one of the few places in the world that offer the capabilities necessary to push the limits of medicine to give a child a drastically improved quality of life. Zion was initially referred to Shriners Hospitals for Children for their expertise in pediatric orthopaedic care, including surgery and rehabilitation. Through a coordinated effort between Shriners Hospitals for Children and CHOP, Zion was evaluated as a possible recipient of the first pediatric hand transplant. The team explain that the collaborative effort between these institutions was necessary to assemble the team and organize the players to orchestrate such a complex and demanding procedure that had never been performed on a child. Before the surgery could be conducted, it was first necessary to locate a suitable donor, a function coordinated by Gift of Life Donor Program, the nonprofit organ and tissue donor program which serves the eastern half of Pennsylvania, southern New Jersey and Delaware. For 41 years, Gift of Life Donor Program has partnered with transplant centers throughout this region to bring innovative transplant procedures to patients in need. As with all types of transplant, surgeries such as this one could not take place without the generosity of a donor and a donor family. The team, the patient and the patient’s family thank them for their selflessness and for their gift that made this surgery possible. The researchers describe Zion Harvey as a bright and precocious eight-year-old who has told them that he cannot wait to someday throw a football. A happy and outgoing child, he has adapted well to life without hands, learning to eat, write and even play video games. He figured out ways to perform most of the activities other kids his age can do. Zion received prosthetics for his feet and is able to walk, run and jump with complete independence. Following his latest surgery and after his upcoming rehabilitation, it is expected that Zion will finally get his wish to throw a football along with a myriad of other accomplishments to come. The surgical team state that a double hand transplantation is a complex procedure involving many surgical and non-surgical components. First, the potential recipient must undergo extensive medical screenings and evaluations before surgery. In this case, the patient’s previous medical condition, following sepsis at an early age, factored into the decision to perform the transplant. Zion’s kidney transplant following his infection made him a candidate for transplant because he was already taking anti-rejection medication, note the surgeons. The clinical team expects Zion to spend several more weeks in CHOP’s rehabilitation unit, and then to be discharged to his home in Baltimore, the team state that they will continue to follow Zion monthly in the short-term and then annually throughout his lifetime.